The Canadian delegation met with Sintraemsirva municipal union leaders in Cali. 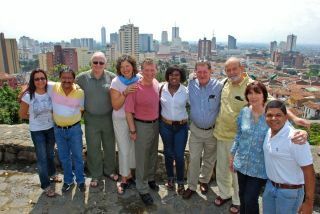 We visited Colombia from July 18-25 on behalf of one million Canadian public sector workers. Our mission, among other tasks, was to see for ourselves whether our opposition to the Canada-Colombia free trade agreement was justified. What we saw and learned confirmed that we are right to oppose this deal and to speak out against it on behalf of Colombian workers and their families. We met with many sectors of Colombian society, including the Colombian Minister of the Interior and government officials, the Canadian ambassador and embassy officials, leaders of the United Central of Workers (CUT) and trade unionists at all levels, members of the opposition Polo Democratico Alternativo, several non-governmental organizations, groups representing indigenous and Afro-Colombian peoples as well as media reporters and ordinary citizens. We visited the poorest of the poor families displaced from their homes by paramilitary groups to benefit transnational companies wanting to expand agriculture production, mining and other business interests. We were told that more than 4 million people, 10 per cent of the population, have been displaced without reparations. We sat with single mothers and grandmothers who have no drinkable water, no sewage, no electricity, little money for food, and no chance of their children ever going to school. These citizens, largely from rural areas, must beg for a living on city streets. In particular, we visited the slums of Cali, known as Agua Blanca (White Water) and the hillside shanty town of La Onda high above Medellin. There we saw abject poverty created by corporate decisions in far-off countries, decisions that have been condoned by the Colombian government and that often fuel the armed conflict that has plagued the country for 50 years. In the extraordinary case of indigenous peoples, the report cited acts of cultural and community genocide. Twenty-eight indigenous groups are in “imminent danger of physical and cultural extinction” and 18 of the communities have less than 10 members. They “are suspended between life and death.” The report went on to cite a horrifying list of human and labour rights abuses that is shocking the world. Colombia continues to be the most dangerous country on earth for trade unionists and civil society activists. Since the beginning of 2008 alone, 32 trade unionists have been assassinated. Colombia has no meaningful legal framework that permits free collective bargaining. The result is that more than 95 per cent of the public sector workforce has no enforceable collective bargaining rights. To sign a free trade agreement with Colombia as long as trade unionists are at risk and free collective bargaining and other labour and human rights continue to be violated can only contribute to an increase in the “crimes against humanity” that were documented by the tribunal. The Commons Standing Committee on International Trade recognized this in its June report, recommending that Canada “not sign and implement a free trade agreement with the Government of Colombia” at this time. In our view, the Canada-Colombia free trade agreement can only convey the opposite of hope for the majority of the 45 million Colombians. It must not be implemented. Denis Lemelin is national president of the Canadian Union of Postal Workers, Paul Moist, national president of the Canadian Union of Public Employees, John Gordon, national president of the Public Service Alliance of Canada and George Heyman, international vice-president of the National Union of Public and General Employees.